Hosts of perennial plants grow in full shade to partial shade, including such species as astilbe, begonias, corydalis, bishop's hat, lungwort, hosta and foamflowers. Perennials easily form the largest group of plants able to grow without the benefit of full sunlight, but are by no means the only types of landscaping tools with such ability. English ivy thrives in areas without full sunshine. 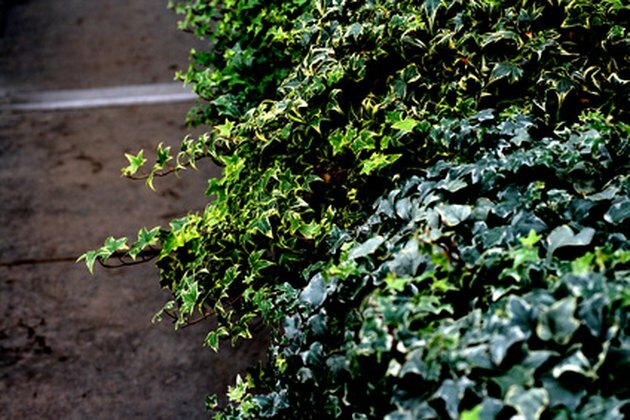 English ivy is among a handful of vines that thrive in the shade, growing to lengths of 80 feet. It is useful for many garden functions, including as ground cover and on trellises. English ivy survives in U.S. Department of Agriculture hardiness zones 4 through 9 as an evergreen perennial plant. Other vines for areas without full sun include certain subspecies of climbing hydrangea and the Japanese climbing hydrangea. You can cover a large portion of a wall with the Japanese version by planting the vines near one, between 6 and 9 feet apart; the heart-shaped, green foliage will form a blanket-like covering in the shade. Tree and shrub versions of the Canadian hemlock dominate the roster of needled evergreens preferring shade. Shrub forms of the tree include Lewis, Moonfrost and Stockman's Dwarf. All grow to heights of 8 feet or less. Canadian hemlock trees, growing to 70 feet in USDA zones 3 through 7, have little tolerance for prolonged drought or heat. Deciduous trees such as the hornbeam species grow best without the help of direct sunlight. Types such as heartleaf hornbeam work as understory trees along woodland edges or as screens and hedges in shady spots. Many types of ferns grow without benefit of abundant sunlight. Ferns often form colonies in the shade, advancing via their underground rhizome root systems to create new growth. 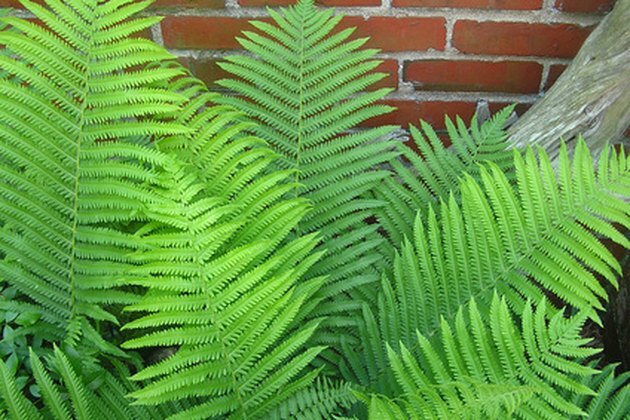 This makes ferns valuable in woodland gardens, shady borders and in naturalized, shady areas. Species such as the northern maidenhair fern grow best when in damp humus. Shade-craving ferns include small types such as walking spleenwort, ebony spleenwort and hart's tongue fern. Larger ferns, growing as tall as 4 feet, are cultivars of the royal fern, the sensitive fern and goldie's shield fern. Some deciduous shrub species, including leatherwood, bottlebrush buckeye, different azaleas and bladdernut, do well in the shade. Annuals for the shade are not plentiful, but impatiens is one type that provides a plethora of color choices among their flowers. Gloxinia, angel wings and tannia are all warm climate plants that develop from bulbs in the shade. Wintergreen requires very specific growing conditions, according to the University of Connecticut plant database, but makes an excellent, evergreen ground cover. It is a broadleaf perennial, as are the zebra plant, partridgeberry and Oregon grape; all are fitting plants for places without much sunlight.